Highly Recommended Product for Marble, Limestone, Italian Marble. Dilution : The product is ready to use and should not be diluted. Preparation: Completely remove any old wax and polish build up. Thoroughly rinse the floor with water and allow drying completely. 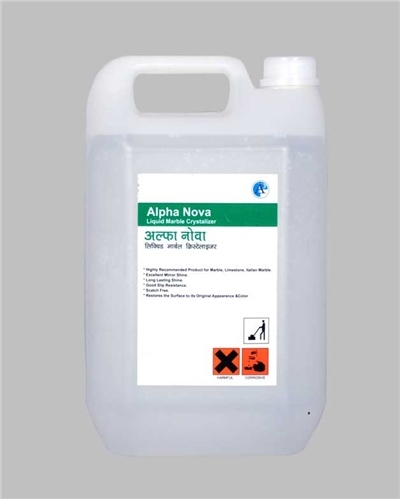 Alpha Nova is applied with a single disc machine and steel-wool/ bronze pads. Sparingly (max 2 -3 triggers of the spray} apply the spray with a spray device or hand sprayer and distribute with a single disc machine 150 - 200 rpm) by moving in circular motion until thoroughly absorbed and dry. A slight shine will be achieved. If a shinier surface is preferred, recrystallize the area once more with 3 triggers and distribute with a single disc machine until thoroughly absorbed, dry and shiny. All abrasives and pads residue must be removed after crystallization by careful damp mopping or wet cleaning. Note: Do not use rusty or dirty pads. To avoid rusting the steel-wool pad which is being used should not lie still for more than 10 minutes during the crystallization, otherwise the pad will dry out.